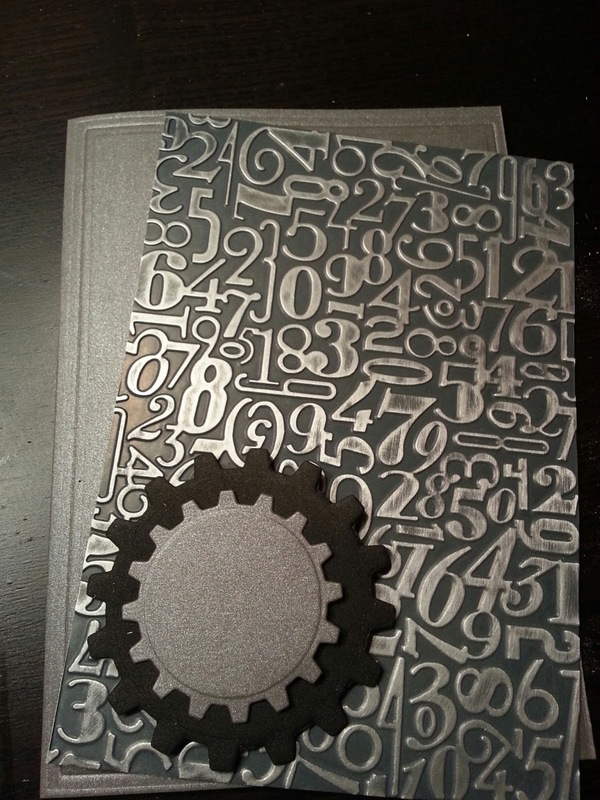 Ken's World in Progress: Die Cut Cogs are Perfect for Masculine or Steampunk Cards...They're Shipping Soon! 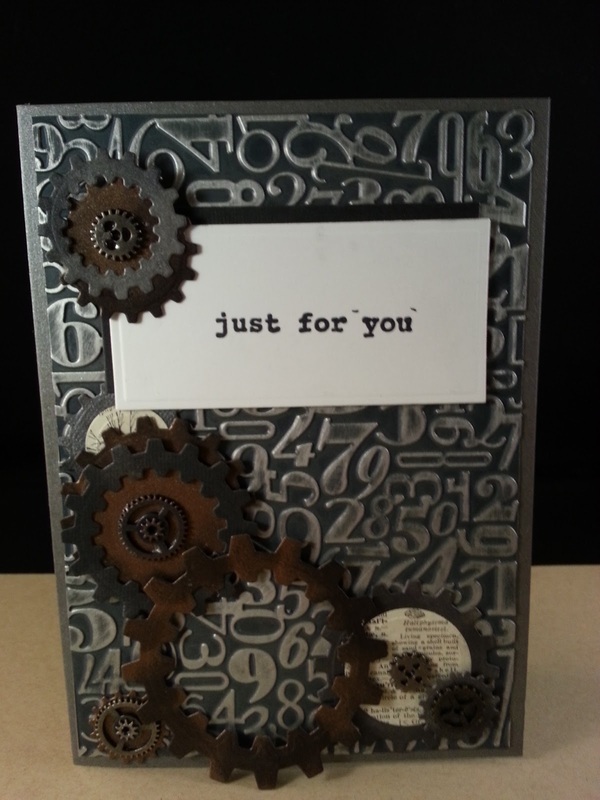 Die Cut Cogs are Perfect for Masculine or Steampunk Cards...They're Shipping Soon! As card makers, we're often challenged with finding the perfect tools and papers to create that perfect masculine card. Since the crafting community is mostly made up of women, it seems like design and style often trend toward feminine motifs like florals and colors are most often soft and pastel...this season Spellbinders has a few new releases that are sure to meet your needs when you need to make a card for that special man in your life. A couple of the newest releases that I really like to use are Numbers and Letters M-Bossabilities Folder, and a new die template called Cogs. These are brand new releases and will begin shipping in mid February...sorry to tease you like this. 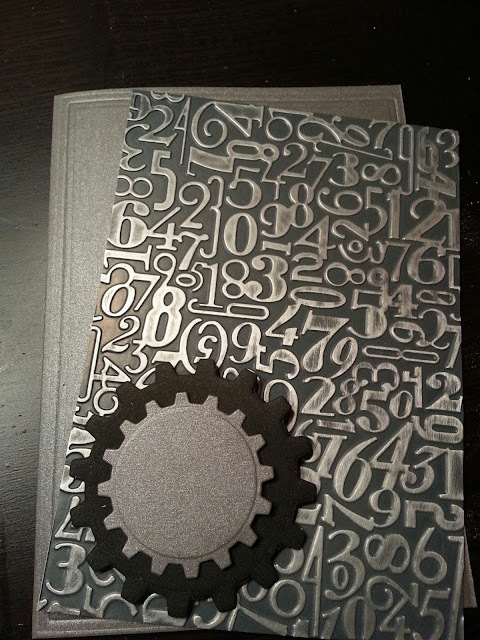 For the card above, I M-Bossed a piece of Spellbinders Precious Metals Premium Craft Foils with the "Numbers" side of the M-Bossabilities folder, then sanded it to bring out the embossed detail. The effect is dramatic and so easy to do. Here's a cool tip: you can use your dies to emboss patterns into paper. 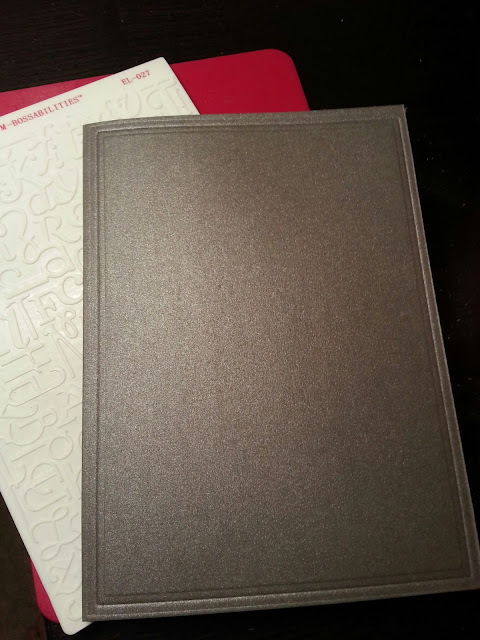 In the image below, I embossed a border around the 5 x7 card with one of the new die templates 5 x 7 Matting Basics A. It's easy to do...rather than use the cutting plate, just use the Embossing Plate and Rubber Embossing mat with your die template and run through the Grand Calibur. Notice the embossed crisp framed border? This technique gives your card a very professional finished look that I think you will love. In the image below, you see the embossed card, the embossed and sanded foil and a couple of the Cog die cuts before they were assembled. The Cog dies are really cool. Since the Cog dies are Spellbinders Nestabilities, they all nest within each other. So, you can nest them together to cut gears and cogs that have a cut out, or negative space in the middle. You'll see this technique in the next card below. And since they are Nestabilities they are compatible with lots of other dies already in your collection. 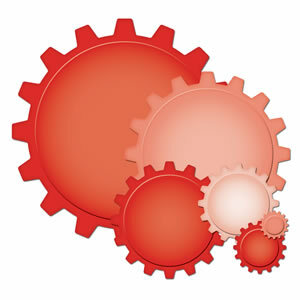 If you'll notice in the photo above, the center of the cog is a circle. That circle is the same size as circles released in our line years ago. So if you wanted to cut a circle photo, or a circle to layer on the cog, your other circle dies will match perfectly. We call this "Building on the Core." Here's an illustration of the die templates included within the Cog die set. They're wonderful for masculine cards, layouts and anything steampunk that you might want to create. For the finished card above, I die cut nested cogs to get that negative space in the middle, it's almost like using the die as a punch. 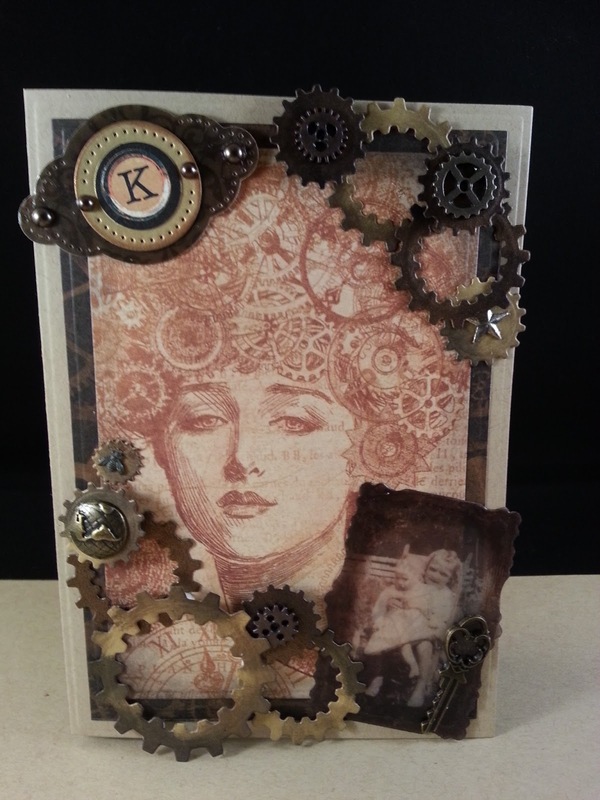 I was able to "build on the core" by cutting layers of book pages with Spellbinders Circle dies to layer on top if the cogs, and I used some cogs that are just cut and embossed. And then added some metal watch gears and findings to complete the card. I love how it turned out...it's the perfect masculine card and perfect for any occasion. 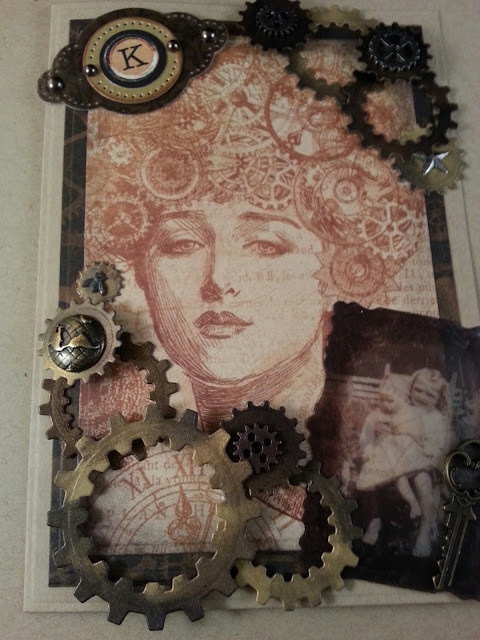 In this next card, I used some of the same techniques as in the card above but used Graphic 45 Steampunk Debutante for the front of the card, and I die cut some "resin" paper for some of the embellishments. The tag on the upper left and the photo on the lower right were die cut from paper that has been coated with ICE RESIN. ICE RESIN is pretty cool stuff, it's clear jeweler's grade resin from an amazing artist, Susan Lenart Kazmer, and most often it's used to fill metal bezels that are then used as charms or pendants for jewelry. You can use it in your paper crafts too. Paper, when coated with ICE RESIN and cured gives paper a very cool, translucent look that is great for paper crafting. 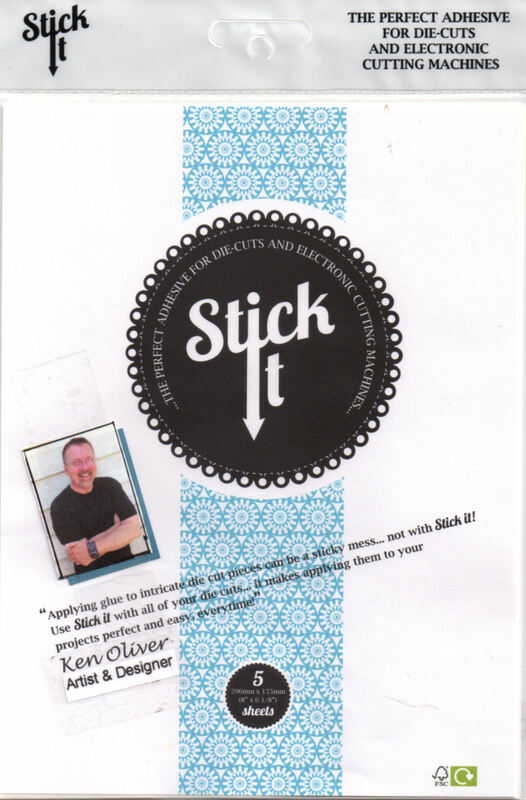 And, it is great for die cutting! I love it. Vintage photos printed on regular copy paper become ethereal pieces of translucent ephemera when "resinated" and die cut. You'll have to try it. In the finished card, you'll see "nested" die cutting techniques that take advantage of negative space to give your card some real dimension and depth. And, I used gold and bronze metalized card stock so they have the appearance of real metal. A little clever inking technique give the die cut togs a patina that makes them feel very mechanical as if they are rusted or still have machine oil on them. 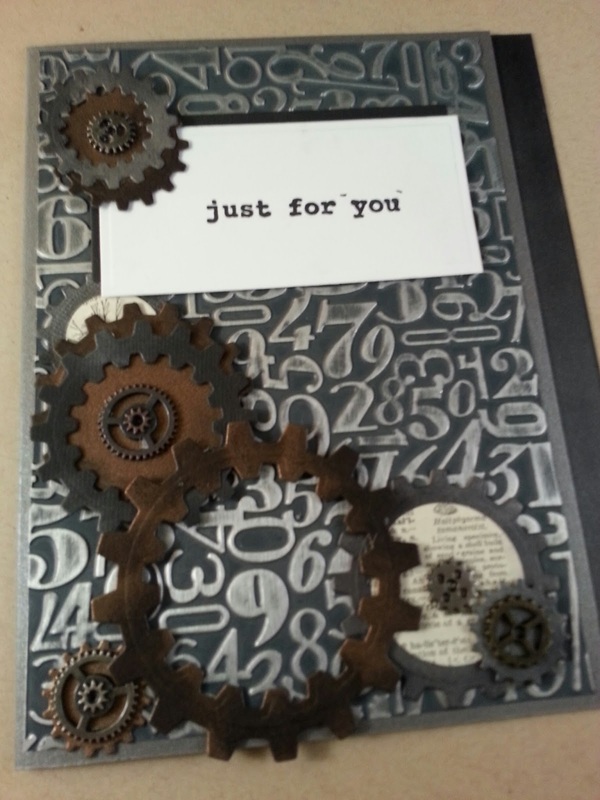 And to finish the card, I added a few small metal cogs, buttons and findings and a small key. I simply affixed them with E6000 for a really durable bond. Again the diecut cogs are perfect for a masculine card or in this case "steampunk" card. 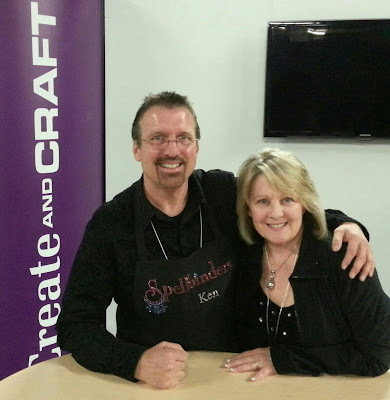 Last week, during CHA in Anaheim, I got to demonstrate some of these techniques for Create and Craft TV and it was a total blast sharing some of my favorite techniques with the audience in the U.K. Thanks for stopping by today. I hope you've picked up a tip or technique or two that you'll love to use. I LOVE comments, so let me know if you have any questions...or if you have a technique you'd like to share. Make it a Crafty Day! Love these for masculine cards and like how you have used them!! By using BullionVault you can obtain physical bullion bars at current spot exchange rates. Register a free account now and get 4 g's in free silver as a welcome bonus.